Check out Shockstrip.com for complete information on this new product, including the testing results, coach, player, and parent testimonials, and information on concussions. Test results include adhesive compatibility, friction coefficient analysis, drop testing, and linear impact testing. Shockstrip is one of many newly-introduced products that claim to reduce impact forces helmet-to-helmet contact that will reduce the chance of micro traumatic brain injury and concussion. 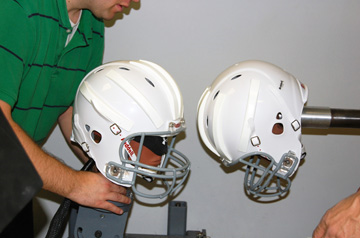 Shockstrip may void the helmet manufacturer’s warranty but they are offering their own warranty in it’s place.